I can’t find the tweet now, but someone joked on Twitter that Radiohead’s social media manager probably had a heart attack when they were told to delete everything. But who knows… maybe they were the one who suggested it. Whoever it was deserves a pat on the back anyhow. The old-school musician promotion tactic was to work hard and get yourself out there – get seen and heard by as many people as possible. As a former musician myself, I can attest to it – I played as many gigs and open mic nights as I could, and whenever I released a CD, I tried a promote it as much as I could (pretty naïvely/terribly, to boot). With the Internet, it’s easy to think “I need to put my music out everywhere” and put it on Myspace (hey, remember Myspace? ), Last.fm, SoundCloud, Bandcamp… and Spotify. But what’s wrong with putting your music on Spotify? Well, the royalty fees are absymal, supposedly. It’d be much better if people bought an actual copy of the music – on CD, via iTunes, etc. – rather than only streaming and listening via Spotify. It used to be the case that if a band wasn’t on Spotify, it was because a) their record label hadn’t sorted things out with Spotify just yet, or b) they’d flat-out refused to be on it (which was the case with the likes of Metallica and AC/DC for a time, and is still the case with Tool). However instances like these are few and far between these days, and obviously Radiohead have indeed shared two singles from the album on Spotify, just not the rest of it. This screams to me that this has been done very much on purpose – they’re choosing not to put the album on Spotify, to encourage more purchases (assuming that people won’t just illegally download/stream it instead, of course). 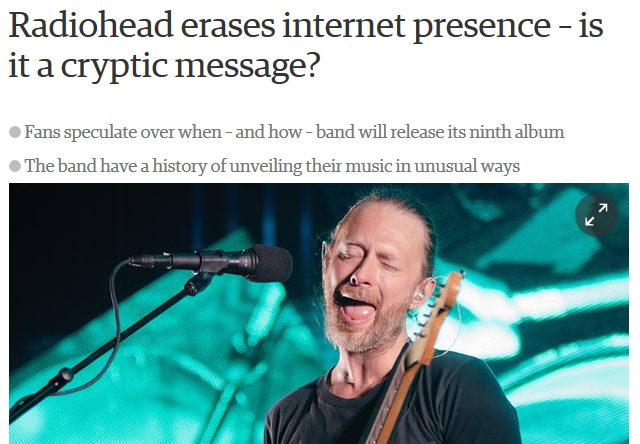 I’ve gotta say, it’s a clever move… Like I said in the intro to this post, I’m not a massive Radiohead fan, but I really like the two new songs that I’ve heard and so I’m really tempted to buy it, depsite being a Spotify-only kinda listener (usually) who rarely ever buys CDs/MP3s anymore. And I’m sure I’m not the only one. Musicians (and, well, anyone) can learn a lot from Radiohead. Be bold and be different to get noticed. And don’t just make yourself easily available because it’s the standard thing to do. Do it well and it will pay off. Radiohead is great at playing the contrarian … geniuses they are!